What’s for dinner? How about one of these recipes?! We’ve all been there – it’s Wednesday night, you just got home from a long day of class, work, and studying on campus, and you’re exhausted. Then it hits you – you’re really, really hungry. Now you’re faced with a decision – should I go out to eat? Or should I make something at home? Now, I’ll be honest. More often than not, the LAST thing I want to do after a long day is cook something for dinner. I can’t decide what to make, I don’t have the ingredients I need, and I just don’t have the time or energy to pull it all together. Preheat oven to 450 degrees. 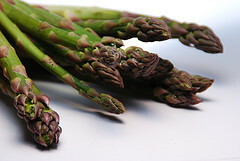 Snap or cut the ends off asparagus spears. Spray the center of a piece of aluminum foil with non-stick cooking spray. Place your piece of salmon in the center of the piece of foil. Put the asparagus spears on top of the piece of salmon, and drizzle the lemon juice on top of that. Sprinkle some salt and pepper on top of that to taste. Then fold up the sides of the foil to seal everything inside, making a nice foil packet (be sure to leave a little room for air to get inside the packet). Place your foil packet on a cookie sheet and cook it in the oven for 15-18 minutes. *If you don’t like salmon, you could totally try this recipe with a chicken breast instead! **To make this a complete, balanced meal, you can add a grain like rice or quinoa! *You can get some of these ingredients from the Carrboro Farmers’ Market! Boil 2 1/4 cups water. Add the brown rice and 1 teaspoon of salt to the boiling water. Bring the water and rice back to a boil, then cover and simmer (be sure to turn the heat down to low) for 30 minutes, until the rice is tender and all the water is absorbed. Once the rice is ready, put it in a big bowl. While the rice is cooking, whisk together the vinegar, sugar, olive oil, remaining teaspoon of salt, and a pinch of pepper. Pour this mixture over the rice. Then add the diced tomatoes and chopped up basil to the bowl. Let the mixture cool a bit, and then enjoy! Consider your financial wellness! Going out to eat and/or ordering take-out can get expensive. If you spend around $8 on a dinner for yourself at Qdoba, Noodles, etc., five times in one week, that would be $40! In contrast, cooking for yourself can cost as low as $20 per week! When living expenses are tight, cooking for yourself is a good way to cut down on your food costs. And how about your physical wellness?! When you go out to eat, you don’t always know exactly what you’re eating, so you’re less able to make sure what you’re eating is balanced and healthy for you! When you cook for yourself you know all of the ingredients, and so you can make sure what you’re eating is balanced, and will give you the nutrients and energy you need to go about your daily business. Plan ahead! On Sunday, plan out your dinners for the week. Pick out the recipes that you want to try and then go grab the ingredients you need at the store. That way, when it’s 8pm on Wednesday and you’re exhausted and hungry, you’ll have EVERYTHING you need to make yourself a yummy meal! Keep it simple! Pick recipes that you think sound good, and that you’re comfortable with! Use your resources! See something in a recipe that you don’t understand (for example: what on earth does “minced” mean??)? Don’t be afraid to ask a friend or consult the internet! You can find all sorts of recipes and tips on Pinterest, and there are COUNTLESS cooking-related tutorials and videos on YouTube that will take you step by step through a particular cooking technique. Have fun! Cook with your friends, cook with your roommates, or surprise a special someone with a delicious home-cooked meal. Cooking is a learning process, so there will be bumps in the road – don’t be afraid to make mistakes! If you mess up a recipe, keep trying it until you’ve mastered it! Previous Article The Best Vegetarian Restaurants in Town!